The Blue Heritage Trail plaque to Anne is on The Grand Hotel, at the site of Anne's lodgings. 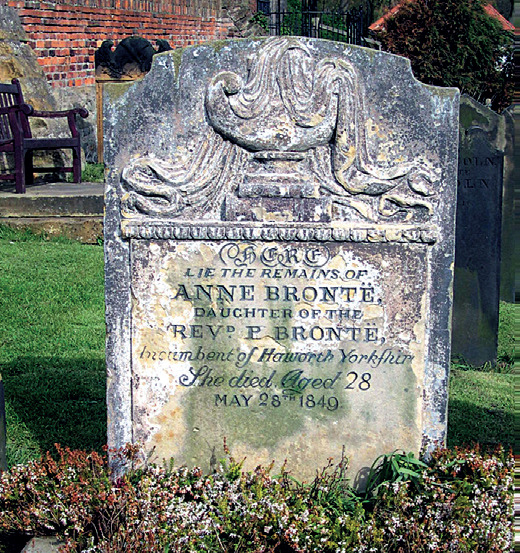 Scarborough held a special appeal for Anne Bronte, youngest of the three famous Bronte sisters. She made three or four visits, and it was here that she chose to come from her Haworth home in the final stages of her fatal illness (tuberculosis). Thanks to a legacy of ?200 from her godmother, Anne could afford to stay at her favourite lodgings in the fashionable St. Nicholas Cliff area - on a site where the Grand Hotel now stands - and to pay the expenses of her elder sister, Charlotte, as well as Charlotte's old school friend, Ellen Nussey. (They were charged 30 shillings a week each for their lodgings). The three of them arrived at No. 2, The Cliff on 25th May1849, where Anne was able to enjoy for the last time the incomparable views. Within three days, she was dead. Because St. Mary's Parish Church was undergoing restoration at the time, Anne's funeral service was held at nearby Christ Church in Vernon Road (close to the present public library) which was demolished in 1979. Ellen Nussey registered Anne?s death and mistakenly entered her age as 28, instead of 29, an error not since rectified on the tombstone in St. Mary's churchyard (see page 24). Charlotte complained later about this and other errors in the inscription. The local Civic Society has erected a commemorative plaque to Anne Bronte next to the main entrance of the Grand Hotel near where No.2 The Cliff once stood. As Acton Bell, Anne Bronte wrote two novels "The Tenant of Wildfell Hall" and "Agnes Grey". She also left us 59 poems, which are perhaps her greatest gift to posterity. 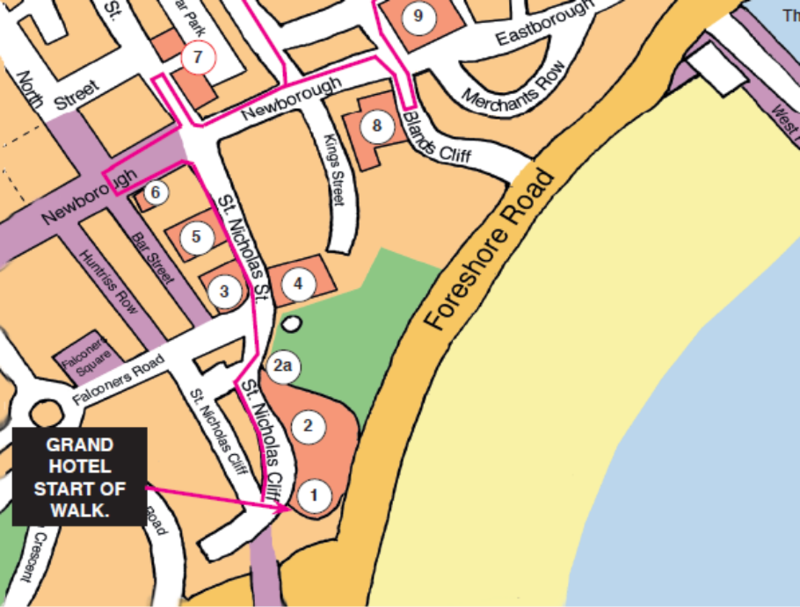 Click here to move on to 2a The Central Tramway.